Boksburg is located to the east of Johannesburg and is part of the Witwatersrand conurbation (know as the East Rand). It became part of the Ekurhuleni Metropolitan Municipality in December 2000. The town was laid out in 1887 to serve the surrounding gold mines and was named after the State Secretary of the South African Republic between 1881 and 1889, Mr W E (Eduard) Bok. The design of the flag of Boksburg, like most South African municipal flags, is based on its municipal arms. This flag was registered with the Bureau of Heraldry on 03 April 1981 and comprised a yellow field with a red border. In the centre of the field was a blue griffin and in each corner was a red tulip. 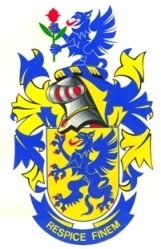 The explanation for the use of the blue griffin is that it is allegedly found on the family arms of the Bok family in the Netherlands, to whom reference is also made in the tulips which are shown on the flag. This, however, could not be confirmed by either the late Dr Cor Pama or Mr S Piennar, both of whom were experts in South African municipal heraldry. The heraldic description of the Arms is: On a yellow background, bordered red, a blue griffin sergeant coward, armed and langued red, and in each corner a red tulip. MOTTO: RESPICE FINEM (Regard the end). Following the re-organisation of local government in South Africa in 1994, this flag was no longer used. 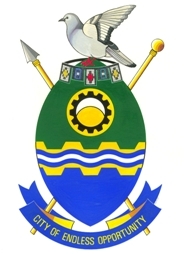 Boksburg was one of the few municipalities to have adopted both a new coat of arms and a flag during the transitional period between 1994 and 2000. These symbols were rather short-lived, being registered with the South Africa Bureau of Heraldry in February 2000. Like its predecessor, this was also an armorial flag based on the new Arms and comprised three horizontal stripes, the upper half of the flag being green and the lower half divided into yellow and blue. A blue, white and blue wavy stripe was placed in the centre of the yellow stripe and the charge from the shield was in the canton. A rectangular flag, proportion 2:3, comprising three horizontal bands, the upper half green and the lower equally divided of yellow and blue, the partition lines embattled counter embattled in the form of mine dumps, the yellow band charged with a blue bar wavy, thereupon another of white; in the canton, centred one third of the distance from the hoist, a bezant charged with a black cog-wheel voided, therewithin a white decrescent. MOTTO: CITY OF ENDLESS OPPORTUNITY. With the re-organisation of local government in South Africa in December 2000, Boksburg became part of the Ekurhuleni Metropolitan Municipality and consequently this flag is no longer used.